We're taking a brief hiatus on the blog while we make the trek to Ontario, Canada where Rick will be teaching a couple classes. We are so excited to meet his students and our fabulous hosts, Chrissie and Justin! We couldn't leave on this wonderful journey without sharing at least one new cake, and we chose a sweets themed birthday cake that perfectly suits the celebratory spirit and happiness we are feeling. Taylor-Marie's birthday party had a candy and sweets theme and design was left up to Rick. Our client wanted a WOW design and something really fun and colorful. Rick made a combination stacked and sculpted design whose colors and vibe matched the party invitation. The cake flavors were Guava Lava and Kona Toffee Crunch. When we brought the cake into the room, the adults eyes lit up and the children's hands started reaching out to touch the cake. 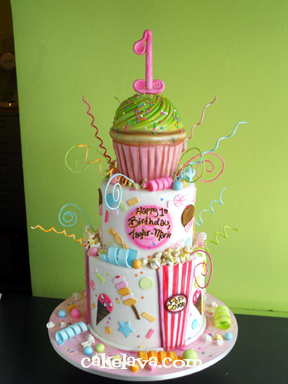 The giant cupcake on top was super cute and looked great with the rest of the design. Happy Birthday to Taylor-Marie! Hey Cakelava.. just found you on facebook and now here.. so excited since you do fantastic work.. just love it.. i posted just a bit ago but it didn't show up so did again just in case you see 2 posts.. Thank you both! Shaile, we did see both your posts, but didn't have a chance to publish it before you submitted the next one. Lila, the theme was a fun one to do. Glad you liked the cake! Meet Shakira, our newest Canine Cake! Classes - Next Stop, Canada - Back for More!